BACKGROUND: Depression and anxiety are common and associated with worse clinical outcomes in patients who experience an acute coronary syndrome (ACS). We investigated the association between major ventricular arrhythmias (VAs) with the progression of depression and anxiety among hospital survivors of an ACS. METHODS: Patients were interviewed in hospital and by telephone up to 12months after hospital discharge. The primary outcome was the presence of moderate/severe symptoms of depression and anxiety defined as a Patient Health Questionnaire (PHQ)-9 score > /=10 and a Generalized Anxiety Disorder (GAD)-7 score > /=10 at baseline and 1 month and PHQ-2 > /=3 and GAD-2 > /=3 at 3, 6, and 12 months. We used marginal models to examine the association between major VAs and the symptoms of depression or anxiety over time. RESULTS: The average age of the study population (n=2074) was 61.1years, 33.5% were women, and 78.3% were white. VAs developed in 105 patients (5.1%). Symptoms of depression and anxiety were present in 22.2% and 23.5% of patients at baseline, respectively, and declined to 14.1% and 12.6%, respectively, at 1-month post-discharge. 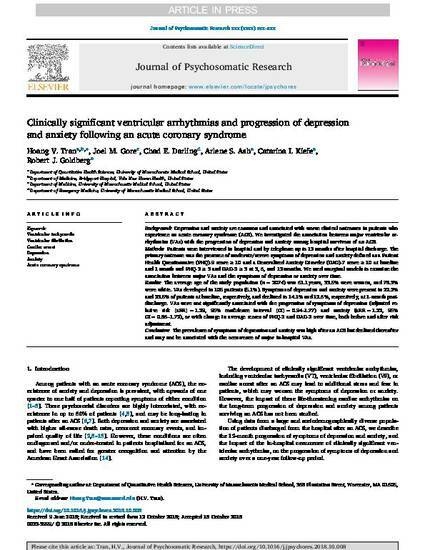 VAs were not significantly associated with the progression of symptoms of depression (adjusted relative risk [aRR]=1.29, 95% confidence interval [CI]=0.94-1.77) and anxiety (aRR=1.22, 95% CI=0.86-1.72), or with change in average scores of PHQ-2 and GAD-2 over time, both before and after risk adjustment. CONCLUSION: The prevalence of symptoms of depression and anxiety was high after an ACS but declined thereafter and may not be associated with the occurrence of major in-hospital VAs.